His enduring image is iconic: eyes shut, elbows bent, head bowed beneath the splayed legs of a soaring Tracy McGrady. Think 7 feet and 6 inches of feeble intentions, a picture of defiance that rivals the unknown protester who stood in front of a tank column at Tiananmen Square  that is, if said tanks had subsequently run the guy over. Sniff. 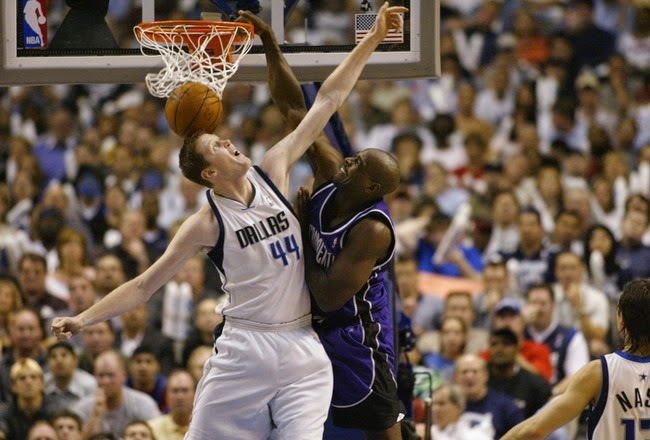 I miss Shawn Bradley already. Beset by knee and hip injuries, Bradley reportedly told the Dallas Mavericks last week that he intends to retire, ending one of the most lampooned careers in recent NBA history. A former No. 2 overall draft pick whose size (mostly) and skills (not so much) were supposed to revolutionize basketball, Bradley never averaged more than 14.6 points in a season, instead becoming a carnival attraction whose primary claim to fame was getting dunked on  hard, repeatedly  by a who's who of the NBA. McGrady with the one-handed hammer. Jason Richardson with a memorable tip dunk. Shaquille O'Neal with too many to count. Facials and derision dogged Bradley in equal measure, so much so that when space aliens stole his talent in the movie "Space Jam," snarky filmgoers joked they couldn't tell the difference. This is unfair. Also, "Space Jam" stunk, almost as badly as that Billy Crystal-Gheorghe Muresan flick. Point is, Bradley had ability. Unique ability, in fact. He was the league's ultimate foil, a world-class dunk enabler, a player whose awkward block attempts made everyone else's thunderous jams look good. Posteriz-ers need posteriz-ees. No one played the latter role like Bradley. To put things another way: Have you ever seen someone in a dunk contest jump over the ball rack? Imagine one with arms. And only slightly less mobile. Darius Miles once said his best professional slam came against Bradley. He had more than one to choose from. Dozens of pros  including Keon Clark and Cuttino Mobley, all 6-foot-4 of him  probably concur. Bradley should be appreciated accordingly, like a rare and precious cubic zirconia. O'Neal's recurrent love taps? Bradley's throwaway sketches. Richardson's tip jam, described by teammate Troy Murphy as "just sitting on Bradley's head"? Big Shawn's "Les Demoiselles d'Avignon." McGrady's rim-quaking, mouthpiece-shaking, face full o' shorts throwdown during this year's playoffs? Bradley's Sistine Chapel, saving the best for last. Upon entering America, Oscar Wilde once said he had nothing to declare except his genius; upon entering Toronto, Bradley would have been justified in proclaiming the same thing. After all, getting kicked by Mobley as he hung from the rim is no easy thing. Uh-uh. It takes a special sort of aptitude. Especially when you're so tall you have to sit sideways on the team bus. Again, consider McGrady's dunk. A stronger player would have knocked T-Mac to the floor. A more athletic player might have stuffed him outright. Erick Dampier would have gotten out of the way altogether, better to save his strength for signing the back of his paycheck. Only Bradley had the perfect blend of height, clumsiness and genuine shot-blocking moxie  his 2,119 career blocks rank No. 10 all-time  to make McGrady's jam look fully awe-inspiring. Dunking over Earl Boykins? Not the same effect. Speaking of effect, sports and romantic comedies alike are packaged as triumphs over insurmountable odds. This is balderdash: if the odds truly were insurmountable, both love and victory would be impossible. What we really want to see are odds just long enough to make things interesting. And what could be longer  yet ultimately less threatening  than Bradley, camped in front of the rim with his arms raised like goal posts? Boy meets ball. Giant, Frankenstein-like complication arises. Boy and ball find rim and live happily ever after, pictured on 1,001 bedroom wall posters across the country. As parents, we teach our children to give their best effort; as adults, we know all too well that effort alone means squat. In the game of life, someone with superior talent will still ram the ball down your craw. Throughout his 12-season career, Bradley took it in the grill more than once. Yet he never complained, never shirked from his dunk-target duty. As a player and a role model, Bradley accepted his lot. Wiped the S-P-A-L-D-I-N-G from his forehead. Picked up his mouthpiece and went back to work. His stoic attitude was commendable. A career salary of more than $60 million probably helped. And considering his salary, Bradley was shamefully underutilized, averaging just 23.5 minutes per game. Worse still, he was never employed as an All-Star Weekend Slam Dunk Contest prop. Why, Vince Carter, why? Things could have been different. Should have been different. Mark Davis, a 6-foot-7 journeyman, once grabbed Bradley by the legs and body-slammed him during a game. Six-foot-one guard Earl Watson (57 career blocks) stuffed Bradley from behind. On a layup. Give Bradley another year in the league, and an airborne LeBron James might hurdle the lanky center completely. Shaq once said he could score 100 points in a game against Bradley. Of course, Shaq was kidding around; in a full 48 minutes, I believe that number would be closer to 120. Sadly, we'll never know. Bradley is just about done, leaving a gawky, clodhopping hole in his wake. Who will seize the rim-rocked mantle? Rik Smits retired years ago. Yao Ming showed early promise, then decided to develop some actual game. Perhaps Andrew Bogut is up to the task. Maybe Frederic Weis will finally play for the Knicks. Possibly, just possibly, there's a young, clumsy giant taking playground abuse right now, dreaming of the day when McGrady rides him like a mechanical bull. In the meantime, Bradley deserves better  at least better than his autobiography selling for $0.33 at an online bookstore. Someone once said that every person of genius is considerably helped by being dead; Bradley's genius was simply appearing that way after giving up a ferocious flush. When the 7-foot-6 bull's-eye makes his retirement official, pay your respects. We may never see his likes on a poster again.